2 The Science of BiOmega Jr.
Omega-3 fatty acids are essential to any effective nutritional program, especially in children. USANA® BiOmega Jr.TM is a fish oil supplement that delivers a healthy amount of the omega-3 fatty acids eicosapentaenoic acid (EPA) and docosahexaenoic acid (DHA), along with vitamin D, in a delectable flavored gel packet format. – Dietary sources of EPA and DHA include fatty fish like salmon, mackerel, tuna, sardines, and anchovies. However, most individuals only obtain 30-100 mg of EPA/DHA daily falling far below the recommended amounts of between 250 mg to 2 grams of EPA/DHA per day. – USANA’s BiOmega Jr. TM comes in a convenient gel packet, it can be easily used by children, adolescents, and adults. Additionally, BiOmega Jr. can be used by individuals who might not otherwise consider supplementing with omega-3s, or have difficulty swallowing tablets and capsules. The Science of BiOmega Jr. Nutrition is a key component in getting a child off to a smart start. These include vitamins, minerals, antioxidants, and healthy and essential fats. Fats are an essential part of our diet. However, we should limit unhealthy fat intake and encourage consumption of healthy fats. Saturated fats found in meat, milk, and cheese help to promote the formation of artery-clogging fatty deposits. The trans-fatty acids (found in partially hydrogenated vegetable oils) are even more harmful to our health. Monounsaturated fats found in vegetable oils do not promote arterial fat deposits and polyunsaturated fatty acids, such as the omega-3 fatty acids, are the most beneficial to overall health. Unfortunately, recent reports suggest that children aren’t getting enough omega-3s out of their diet for adequate nutrition, causing public health concerns. Developing a healthy body early in life can have long-term, positive effects. Some research suggests that early nutrition can induce lifelong effects on metabolism, growth, neurodevelopment, and cardiovascular health. Several clinical studies have shown omega-3 fatty acids are beneficial for supporting the heart and vascular system throughout our lives*. So what can be done about the problem of kids, adolescents, and adults not eating enough fatty fish? Are there any alternatives? Along with a healthy diet, a high-quality supplement is a great place to start. USANA’s BiOmega Jr. TM delivers a beneficial amount of omega-3 fatty acids EPA and DHA, along with vitamin D, in a delectable flavored gel packet format. One gel packet provides 350 mg of EPA and 230 mg of DHA omega-3 fatty acids. BiOmega is a whole-body oil (not a liver oil) made from anchovies and sardines – small fish with short lifespans, which are naturally much lower in contaminants than larger fish species such as salmon and tuna. In fact, the raw material (pre-refining) oils used in BiOmega are already lower in PCBs (polychlorinated biphenyls) than established guidelines for finished products. It is then purified using repeated high vacuum molecular distillation, and the finished product is tested again for heavy metals and other contaminants. Ages 4–12 years—take one (2.5 g) packet every other day with or without food. Serve Chilled for an even better taste. What is the difference between BiOmega and BiOmega Jr.? USANA’s BiOmega Jr. is a fish oil supplement that delivers healthy amounts of the omega-3 fatty acids eicosapentaenoic acid (EPA) and docosahexaenoic acid (DHA), and vitamin D, in a delectable, sugar free, flavored gel format that is friendly for kids or adults who have a hard time swallowing capsules. How much EPA and DHA are in BiOmega Jr? 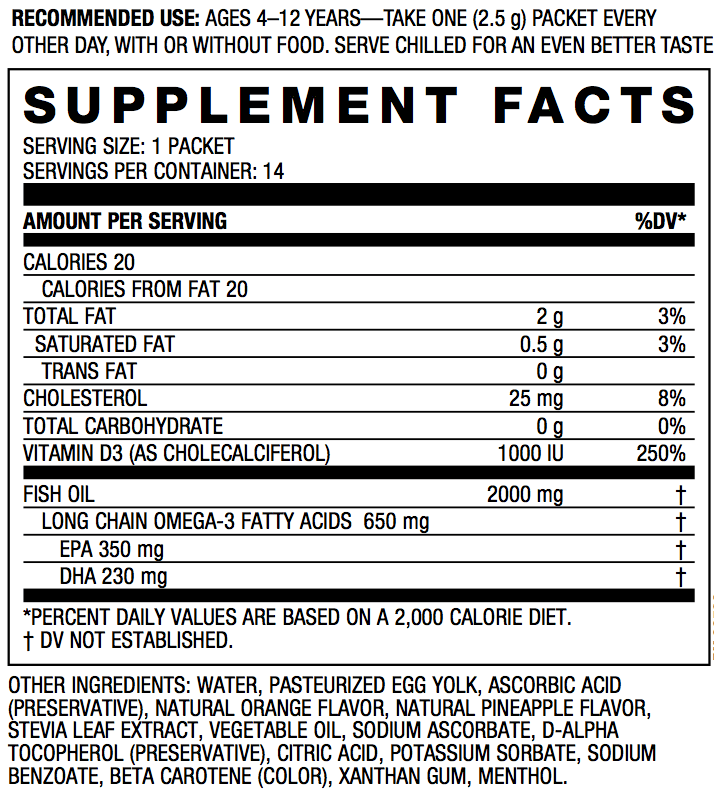 Each serving (1 packet) of BiOmega Jr. has 650 mg total of omega-3 fatty acids. 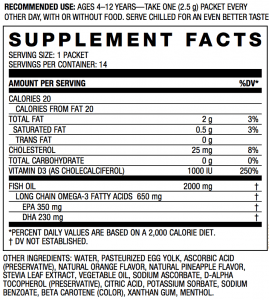 Of which 350 mg are eicosapentaenoic acid (EPA) and 230 mg are docosahexaenoic acid (DHA). Can adults take BiOmega Jr? Yes, the BiOmega Jr. can be used by adults who prefer it, or who cannot swallow capsules. The dosage of omega-3 fatty acids in a packet of BiOmega Jr. is similar to one BiOmega capsule. BiOmega Jr. is a fish oil supplement that supplies the important omega-3 fatty acids EPA and DHA in a creamy flavored gel. How is BiOmega Jr. TM purified? BiOmega Jr. TM is a whole-body oil (not a liver oil) made from anchovies and sardines – small fish with short life spans which are naturally much lower in contaminants than larger fish (such as salmon, tuna, etc.). In fact, the raw material (pre-refining) oils used in BiOmega Jr. are already lower in PCBs than established guidelines for finished products. It is then purified using a process called high vacuum molecular distillation (twice) and the finished product is tested for heavy metals and other contaminants. Molecular distillation removes impurities (heavy metals, dioxides, etc. ), saturated fats, and other undesirable organic compounds. Molecular distillation is gentle with exceptionally low heat residence time and is performed in a vacuum to further reduce heat requirement. Any potential impurities and saturated fats are distilled out of the oil, leaving only the key beneficial components of the fish oil. What fish species are used to make BiOmega Jr? BiOmega Jr. is sourced from deep-sea cold water fish species (anchovies and sardines). Can I add BiOmega Jr. to food? Yes, BiOmega Jr. is packaged in convenient one-dose pouches that don’t require refrigeration, which makes it convenient to take at home or on-the-go. Simply tear off the top and squeeze BiOmega Jr. directly into your mouth, into yogurt, directly on to fruit, or in a smoothie. There are many possibilities. Is it OK to store BiOmega Jr. in the refrigerator? While refrigeration is not necessary, it is fine to store BiOmega Jr. in the refrigerator. However, freezing and heating should be avoided, as it may cause the formula to separate. Is BiOmega Jr. made with the triglyceride form of fish oil? Yes, BiOmega Jr. is made with the triglyceride form of fish oil. Does BiOmega Jr. contain vitamin A? No, BiOmega TM does not contain vitamin A. Unless added by the manufacturer, only fish oil supplements specifically made from fish liver (such as cod liver oil) will contain vitamin A. Does BiOmega Jr. contain gluten? Most USANA products do not contain wheat, oats, rye, barley, or gluten. What is the caloric content BiOmega Jr.? Twenty calories per daily dose. What ages are recommend to take BiOmega Jr.? Ages 4 to 12 to take one packet every-other-day. Ages 12 and older take one packet daily. Connor WE. Importance of n-3 fatty acids in health and disease. 2000. Am J Clin Nutr 71(suppl):171S-5S. Dalton A, Wolmarans P, Witthuhn RC, Van stuijvenberg ME, Swanevelder SA, Smuts CM. A randomized control trial in schoolchildren showed improvement in cognitive function after consuming a bread spread, containing fish from a marine source. 2008. Prostaglandins Leukot Essent Fatty Acids. 80(2-3):143-9. Greenberg JA, Bell SJ, Ausdal WV. Omega-3 Fatty Acid Supplementation During Pregnancy. 2008. Rev Obstet Gynecology 1(4):162–169. Madden SM, Garrioch CF, Holub BJ. Direct diet quantification indicates low intakes of (n-3) fatty acids in children 4 to 8 years old. J Nutr. 2009;139(3):528-32. Williams C, Birch EE, Emmett PM, Northstone K, the Avon Longitudinal Study of Pregnancy and Childhood (ALSPAC) Study Team. Stereo acuity at age 3.5 y in children born full-term is associated with prenatal and postnatal dietary factors: a report from a population-based cohort study. 2001. Am J Clin Nutr 73:316-22.